The band struck up Hooray For Captain Spaulding from the Marx Brothers’ 1930 movie hit Animal Crackers and another edition of America’s most popular radio and television quiz show was underway. Network Radio Ratings, 1932-53, reports a Crossley average rating of 18.9 for Flywheel which finished in 17th place for the season. It would Groucho’s highest ranking for the next 15 years. The Marx of Time, a satirical take on The March of Time, followed for a brief six weeks on the CBS Sunday schedule and a single digit rating buried in 59th place seemed to seal Groucho and Chico’s reputation as unable to carry a series. So, the brothers pursued their film careers with the highly successful MGM comedies A Night At The Opera, A Day At The Races and Room Service while becoming frequent guests on programs hosted by others. 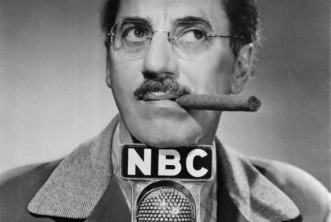 Groucho’s quick wit and ad-lib abilities were most notable in his appearances on the unscripted Information Please. (1) All of his other guest shots - including his and Chico’s, semi-regular roles on 1939’s The Circle which was made to sound like impromptu conversation by its panelists - were scripted. His last attempt at a variety radio series came in March, 1942, with Blue Ribbon Town named after the Pabst beer. The CBS show was a low-budget throwaway co-starring Leo Gorcey of the movies’ Dead End Kids ensemble and singers Virginia O‘Brien, Kenny Baker, Bill Days and Fay McKenzie. A sample of Blue Ribbon Town with guest Jack Benny from February, 1944, is posted as an example of why the program finished in a sad 52nd and 71st place in its two seasons. The only bright spot in the early to mid-1940’s was a reunion film with his brothers after a five year layoff in 1946, A Night In Casablanca, co-starring the wonderful German character actor Sig Ruman who was also featured in the brothers' A Night At The Opera and Day At The Races in the 1930‘s. Insofar as radio work was concerned, Groucho was once again consigned to doing occasional guest shots. The turning point in Groucho’s radio career began on April 27, 1947, when he was booked to appear in the annual Walgreen Drug Stores anniversary show hosted by Bob Hope to launch the chain’s yearly One-Cent Sale. The 60 minute program was transcribed for non-network placement by Walgreen on June 19th in some 300 markets. Producer John Guedel recalls that he accompanied Art Linkletter and actor Cesar Romero to the show where they performed a People Are Funny stunt near the top of the program. Guedel then took a seat in the audience to watch the rest of the show. What he witnessed was the inspiration for You Bet Your Life. Shortly after the program’s midway point Groucho was introduced in a skit with Hope written by Manny Manheim and Charlie Isaacs. The setting was a radio station in the middle of the California desert run by Hope where Groucho comes calling to sell him a mink coat. Following is a transcript of the sketch as reported by Groucho’s son, Arthur, in his book, The Secret Life of Bob Hope. HOPE: Why, Groucho Marx! What are you doing out here in the desert? MARX: Desert, hell! I’ve been sitting in the dressing room for 40 minutes. HOPE: Mink coats for only 40 dollars! How can you sell them so cheap? MARX: I have no overhead, I don’t advertise, I don’t pay rent…and I steal the coats. HOPE: Groucho, I know you don’t steal those coats. Where do you get ’em? MARX: Very simple. I trap them with my big musical trap. I walk out to the woods and play seductive music on my zither. The little animals hear the music, do a strip tease and take off their furs. HOPE: Did I ever tell you about the two vultures who were plucking each other? MARX: Well, it’s hard to do without two. HOPE: (TO ENGINEERS) You can start editing the record now, fellas. HOPE: Oh, we would be faded…(i.e.Censored). MARX: That’ll be the biggest crap game in history. MARX: (THROWS HIS SCRIPT DOWN) Or do you want to quit right now? HOPE: I’m never going to feed you another line again. MARX: Did I ever tell you about the two vultures who were plucking each other? HOPE: You know we have a hook-up with Lea Frances…(i.e. Famous Hollywood madam). HOPE: I don’t need a mink coat. I’m an etching man myself. MARX: Well, if you wear one of my mink coats you’ll be etching. MARX: I fear the girls will be to warm in my mink coats out here in the desert. HOPE: I always find the girls are warm when you promise them the coats. Once they get it they cool off. MARX: Not these coats, Bob. These coats are all hot. The two comedians returned to the script for another 30 seconds and finished the innocent sketch turned censor’s nightmare. Fortunately, it was recorded and editing the routine was relatively easy - although the really funny parts of it were never heard on radio. Nevertheless, as Guedel looked, listened and laughed along with the studio audience, he got an idea. A partnership deal was stuck between Marx and Guedel and a 15 minute audition record, (posted below), was cut with House Party announcer Jack Slattery and several “plants” as contestants. Guedel then made the rounds of the networks and agencies with his record but found no buyers for a comedy quiz hosted by the comedian who was considered a four time loser in Network Radio. Then Guedel learned that Allen Gellman, CEO of jewelry maker Elgin-American - not to be confused with Elgin Watches - was in Los Angeles prepared to sign on as sponsor of another comedy-quiz, Phil Baker’s Everybody Wins on CBS. Just like his last-minute sale of People Are Funny to Brown & Williamson Tobacco five years earlier, Guedel pulled Elgin-America out of the fire and took the show to ABC which was delighted to take a new sponsor from CBS. ABC gave You Bet Your Life a prime Wednesday slot at 9:30 between Abbott & Costello and Bing Crosby’s Philco Radio Time. Unfortunately for Marx and Guedel, the time slot was also opposite Wednesday’s top show, NBC’s Mr. District Attorney, Network Radio’s highest rated continuing drama series. When the 1947-48 season ended, You Bet Your Life finished in 72nd place with a mediocre 13.0 rating to Mr. District Attorney’s 21.1 rating in twelfth place. And that wasn’t the only problem. Groucho felt uncomfortable trying to be funny talking to virtual strangers while the clock ticked away. Guedel’s staff recruited and thoroughly screened the contestants with successful methods learned from People Are Funny, but the pressures of a live performance were something else again. To the crafty Guedel, however, the answer was simple: let Groucho take his time, record the program on tape a week ahead of time, then edit out the pauses, fluffs, the host’s occasional wanderings into questionable taste and come up with a tightly produced half hour for broadcast. The recording technique paid off with a better show and the 1948-49 season showed promise. You Bet Your Life improved to 46th place with a 12.1 rating while Mr. District Attorney remained in twelfth place but slipped to a 16.6. Naysayers contend that much of Groucho's material was prepared for him by You Bet Your Life writers Ed Tyler and Hy Feedman. A recording of an unedited performance from February, 1949, is posted below. The first three minutes are particularly funny as Marx continually interrupts announcer Fenneman’s attempts to open the show. There's no question that this exchange, at least, is pure Groucho. Guedel moved the show to CBS on October 5, 1949, and a 9:00 p.m. Wednesday timeslot for the season which accomplished two purposes. First, it increased coverage for You Bet Your Life from ABC’s 117 affiliates cleared for the show to the CBS total of 154 stations. Secondly, it got Groucho away from the shadow of Mr. District Attorney and into competition with another quiz show, NBC’s Break The Bank. The move was an unqualified success. You Bet Your Life became Network Radio’s top rated quiz show, finishing the season in eleventh place with a 14.9 rating. The move to CBS was also too costly for Elgin-American which dropped out as Groucho’s sponsor in December. Guedel easily sold You Bet Your Life to the DeSoto-Plymouth Division of Chrysler Corp.- an association that lasted in radio and television for most of the next decade. The ten-year package deal, worth $4.0 Million to Marx and Guedel, involved moving the show to NBC Radio and Television beginning on October 4, 1950. For television, Guedel simply employed eight cameras working in tandem from four positions to film the radio show and later edited the film as he did the audio tape. The finished radio show aired on Wednesdays and the television version was broadcast on the following night. Both were successful - You Bet Your Life finished in the Annual Top Ten from 1950 to 1953 - as Groucho Marx, the former four-time loser, concluded Network Radio’s Golden Age as one of its biggest winners. (1) See information Please on this site.